So glad you found me! My name is Jewels and I'm a mom to four rambunctious, adorable boys. I work from home online so that I can spend more time with my kids and so can you. Join me over at Info Barrel and get started today! Have you ever glanced over at your neighbor’s home and wished that yours looked more like theirs? It always feels put together and there’s just something about it that draws your eye every time. 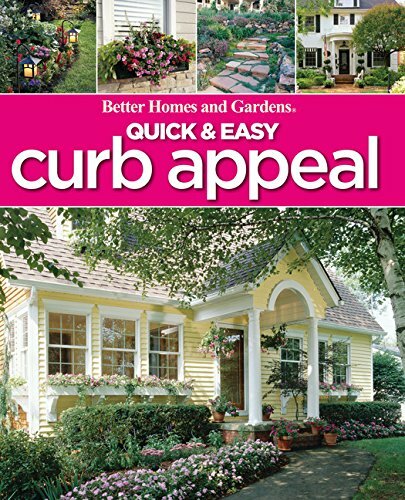 We’re talking curb appeal and with a few quick steps, you too can be the envy of the neighborhood. Take a second look at your outdoor lights. Do they add to the character of the home? Or are they worn out and feeling like more of a liability? Sometimes simply buying a few new outdoor fixtures can make all the difference. The best part is that most lights are affordable and relatively easy to install. Head out your local hardware store and bring home a handful of favorites. Hold them up against the house to see what looks best and then buy the lot and prepare to see the glances admirably aim in the direction of your home. Next up, the mailbox. Mailboxes often get overlooked as solely the spot to grab and drop your post office wares but think again. There are so many looks and styles available today that picking the right one can really help your house to stand out from the crowd. Even if you’re not up for going whole hog on a completely new mailbox, sometimes just replacing the box portion is enough. In our case, we had a couple small dents paired with the fact that it was 15 years old. The box worked ok (most of the time) but for $20 we bought a new top, attached it to the pole and it’s made all the difference, not to mention it looks pretty darn snazzy. Fix it up. Take a good look at the outside of your home. Is there anything that needs to be repaired or updated? Do you have any visible rotted wood? Is the garage door working properly? How about the paint job on your home; does it need to be refreshed? Some of these fixes can be bigger than others, but all of them will make a huge impact on the curb appeal of your home which in turn can increase the overall value when it comes time to sell in the future. It’s an investment that you can put in now in order to reap the benefits down the road. Clean it up. I realize that this may be an obvious one to many of us, but that doesn’t mean we’re always good about doing it. Time is a precious commodity and yard work isn’t always our first choice of how to spend the weekend, but do yourself a favor and, every so often, move it to the top of the list. Trimming bushes, brushing away and treating for bugs/spiders, raking, mowing and weeding all help to improve your overall curb appeal. A power wash once or twice a year on the house and driveway doesn’t hurt either. If you really despise the thought of yard work, look into hiring out the job. Most yard care companies are fairly affordable and do good work. Add a touch of you. So you’ve cleaned and fixed it up, the mailbox and lights are looking amazing, but it still needs a little something. This is where you put the cherry on top of the chocolate sundae. There are many ways to personalize the outside of your home. If you have a southern porch like I do, hanging some ferns or flowers can add a pop of color to the entrance. A strategically placed bench or a few outdoor chairs can add appeal. A nice wreath for the front door is always a welcoming feature, and for goodness sake, don’t forget a cute doormat to greet your guests as they enter your home. Invest a little time and money into your home’s curb appeal and I guarantee that you’ll have your neighbors and, more importantly, yourself glancing in the general direction of your home instead of the other way around. Once again thanks for the information and linking to your other article. I especially needed to read the point about the mailbox as I would have probably overlooked it. It's a piece that we sometimes forget about. In our case, it still worked but had a slight dent from the high school kids, was rusting around the edges and just looked a bit old. A new box made all the difference. Thanks for the comment!